The Fermi Gamma-Ray Space Telescope (FGST), formerly GLAST, is a major NASA mission dedicated to observations of high energy gamma rays. Launched on June 11 2008, its main instrument, the Large Area Telescope (LAT), provides unprecedented sensitivity to gamma rays in the energy range of about 20 MeV to about 300 GeV. The Gamma-ray Burst Monitor (GBM) complements the LAT in its observations of transient sources and is sensitive to X-rays and gamma rays with energies between 8 keV and 40 MeV. The combination of the GBM and the LAT provides a powerful tool for studying gamma-ray bursts, particularly for time-resolved spectral studies over a very large energy band. To follow the progress of Fermi, please read the blog. The operation of the Gamma-ray Burst Monitor and analysis of its observational data continues to be a collaborative effort between the National Space Science and Technology Center in the U.S. and the Max Planck Institute for Extraterrestrial Physics (MPE) in Germany. The Principal Investigator is Dr. Colleen Wilson-Hodge at NSSTC. 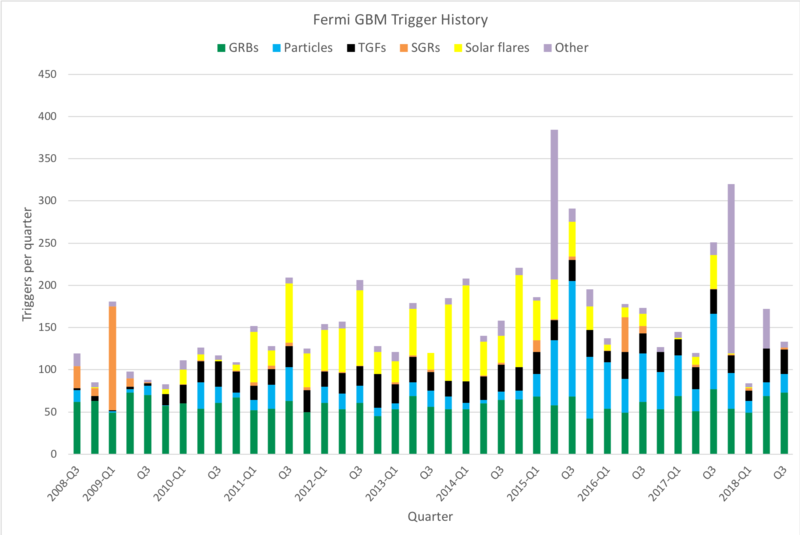 Access to Fermi GBM data is provided by the Fermi Science Support Center through this portal. A trigger history for GBM is shown in the following plot. 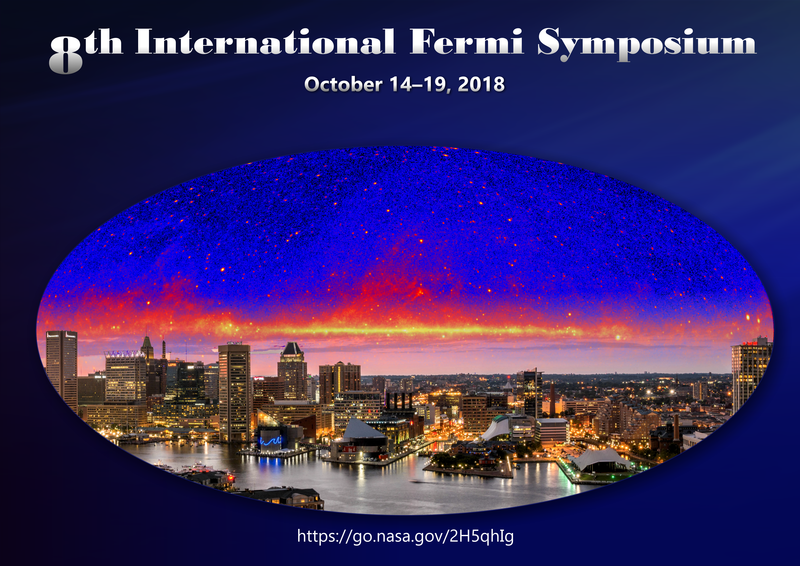 The Eighth International Fermi Symposium will be held in Baltimore, Maryland from October 14-19, 2018. More information can be found here. 15-20 October 2017: The Seventh International Fermi Symposium was held in Garmisch-Partenkirchen, Germany. Proceedings can be found here. 9-13 November 2015: The Sixth International Fermi Symposium was held in Arlington, Virginia. 20-24 October 2014: The Fifth International Fermi Symposium was held in Nagoya, Japan. Proceedings can be found here. 28 October- 2 November 2012: The Fourth International Fermi Symposium was held in Monterey, California. Proceedings can be found here. 9-12 May 2011: The Third International Fermi Symposium was held in Rome, Italy. Proceedings can be found here. 2-5 November 2009: The Second International Fermi Symposium was held in Washingtong DC. Proceedings can be found here. 5-8 February 2007: The First International Fermi Symposium was held in Stanford, California. The Second GBM Gamma-Ray Burst (GRB) Catalog is Now Available Online. Two journal papers appeared in the Supplement Series of the Astrophysical Journal. The General Catalog (A. von Kienlin et al.) and the Spectral Catalog (D. Gruber et al.) are both available now. GBM scientist Valerie Connaughton presented results from observations of Terrestrial Gamma-ray Flashes (TGFs) correlated with radio emissions seen by the World Wide Lightning Location Network (WWLLN) that show WWLLN is detecting current from electrons in the TGF itself rather than the associated Intra-Cloud lightning. A press conference was held at the American Geophysical Union meeting in San Francisco to discuss these exciting results. The Fourth Fermi Symposium was held in Monterey, CA in Fall 2012. The Fermi/Swift GRB Conference 2012 was held in Munich. The First GBM Gamma-Ray Burst (GRB) Catalog is Now Available Online. Two journal papers will appear in the Supplement Series of the Astrophysical Journal. The General Catalog (W. S. Paciesas et al.) and the Spectral Catalog (A. Goldstein et al.) are both available on the arXiv server. A two-day workshop covering the science of Terrestrial Gamma-ray Flashes (TGFs) was held last summer in Huntsville. TGFs have been a fruitful area for scientific research with GBM, and this workshop covered all areas of TGF science, from gamma-ray observations to correlations with lightning to TGF theory. GBM scientist Michael Briggs presented results from observations of Terrestrial Gamma-ray Flashes (TGFs) that show a signature of the annihilation of antimatter in the form of positrons hitting the spacecraft. A press conference was held at the American Astronomical Society meeting in Seattle to discuss these exciting results. GBM scientist Colleen Wilson-Hodge presented observations of the Crab Nebula using GBM data and the Earth Occultation Technique that show the Crab brightness varying by a few percent over the last few years. This result was confirmed using data from other instruments, suggesting this standard candle for astronomy actually flickers. A press conference was held at the American Astronomical Society meeting in Seattle to discuss these exciting results.